This tutorial explains how to write a while loop in the C# language. A while loop is used to repeat a section of code while a condition evaluates to true. For example, keep asking for a password while the password being entered is wrong, or keep displaying a message a number is less than a certain number, or keep moving a character in a game to the right side of the screen while the right arrow key is being pressed on the keyboard. A while loop is a pre-test loop meaning it tests a condition before running code inside the loop. If the condition being tested never evaluates to true then the loop will not run. After each iteration of a loop, if the condition being tested evaluates to false then the loop will exit and the rest of the program will run. It is important that you allow loops to eventually end by specifying a condition that will eventually evaluate to false, otherwise you will end up having an ‘infinite loop’ causing your program to crash. This tutorial explains how to write switch statements in C# language. Switch statements are used to select one from many different blocks of code. A switch statement can take a variable and check if its value matches one of many different specified values. Once the switch statement finds a matching case, it will run the code inside that case and the stop testing all the other cases. Watch the video below and then scroll down to the sample code to see how switch statements work. We can check, for example, if a number is less than, greater than, less than or equal to, greater than or equal to, equal to, or not equal to another number. We can also check if a string variable is equal to another string value (for example, checking if a password is correct). To make comparisons, we will need to be familiar with comparison operators. Comparison (or equality) operators are used to compare two values. The result of using an equality operator can either be true or false. The only type of variable that can store the result of an equality operator is a Boolean. The table below describes the comparison operators used in C#. == This operator is used to check if two values are equal eg. x == 5 would return true if x had a value of 5. > and < The ‘greater than’ and ‘less than’ operators are used to check if values are greater than or less than another value. For example, x > 5 (if the value of x was 3 than it would return false). >= and <= The ‘greater than or equal to’ and ‘less than or equal to’ operators are similar to the ‘greater than’ and ‘less than’ operators. For examples, 5>=5 would return true because 5 is equal to 5, and 6<=10 would return true because 6 is less than 10. != The ‘not equal’ operator is used to check if two values are not the same as each other. For example, x != 10 would return true if the value of x was 9 because 9 is not equal to 10. However, y != 5 would return false if the value of y was 5. Watch the video below which shows how to make comparisons using if, else if, and else statements (scroll down for the sample code). We can also check if multiple conditions evaluate to true or if at least one of multiple conditions evaluate to true in a single if statement using logical operators. Logical operators are used for complex conditions. The table below describes each logical operator. && This is known as the AND operator and is used to check if both values are true in a complex condition. || The is known as the OR operator and is used to check if at least one of the values is true when two values are compared. It will return true if either one or both values are true.
! This is known as the NOT operator and will return the opposite of a Boolean value. For example !true; would return false and !false; would return true. Here is an example of using the && logical operator to display a message only if a user’s first name is “Joe” AND their last name is also “Bloggs”. Watch the video below to see how you can use logical operators in conditional statements and then scroll down for the sample code. This tutorial shows you how you can combine types in a Console.WriteLine() output statement. For example, you can combine a string with an integer or float value. Watch the video below and scroll down for the sample code. Comments are useful for explaining the purpose of a piece of code or how it works. Comments can also be used to identify the author of code or when it was created or last updated. In C# the // characters (two forward slashes) are used to add comments to your code. Any text on a line after the two forward slashes will not be treated as code. Comments are useful as they contain notes about what is happening in the code and can help others understand the algorithm. They won’t change the way a program runs and won’t be visible in the working program. Watch the video below to see how to use comments and scroll down for the sample code. In this tutorial we will look at arithmetic and assignment operators used in the C# language. Later on in these tutorials we will also look at equality and logical operators when we work with conditional statements. Arithmetic operators are used for performing standard math operations on variables and are usually only used on number variables eg. int and float (although they can be used for other things too eg. the + operator can be used to join two strings together). + Addition – this operator is used to add two numbers together. It can also be used to concatenate (join) two strings together. – Subtraction – this operator is used to subtract one number from another. * Multiplication – this operator is used to multiply two numbers together. / Division – this operator is used to divide one number by another. % Modulus – this operator is used to divide one number by another but instead of returning the result, it returns the remainder of the division. Eg. 5%2 would return a result of 1. The assignment operators follow standard mathematic order of operations. That means that the math works from left to right. Parenthesis are done first, multiplication and division comes second, and then addition and subtraction come third. For example: x = 5; (or int x = 5; if the variable’s type has not already been declared). The table below shows the different assignment operators available in C#. = The equals sign is used to assign the value on the right side of the equals sign to the variable on the left side of the equals sign. += , -= , *= and /= These assignment operators are also used to perform arithmetic operations and assign the result to the variable eg. x *= 5 is the same as saying x = x * 5. ++ and — These assignment operators are called increment and decrement operators and are used to increase or decrease the value of a variable by 5. For example, x++ is the same as saying x = x + 1. Watch the video below to see how arithmetic and assignment operators are used in the C# language and then scroll down for the sample code. In this tutorial you will learn about variables, constants and data types in the C# language. Variables are like containers that can store data that you will use in your application. Variables can be given a value to store that can be accessed and modified or updated throughout the program whereas constants are given a value that can’t be changed in another part of the program – in other words the variable’s value is constant throughout the program. Variables and constants must be given a unique name (starting with lowercase letter and cannot contain spaces or special characters) and they must have a certain type. A type specifies the kind of data that a variable can hold. A variable that has a name and a type can then have a value assigned to it. The line of code above says that a new variable called myNumber is being declared. It is of the int (integer) type and is assigned a value of 5. The table below shows the data types available in the C# language. float The float data type stores floating point numbers (numbers with decimal places). double The double data type stores floating point numbers but with double precision. char The char data type stores a single character such as a letter, number, space or special character (eg. a, 1, !). A char value is written in single quotes eg. ‘a’. string The string data type stores letters, numbers and other characters in the form of words or sentences. A string value is written inside double quotes eg. “Hello World”. Welcome to the Coding in C# tutorial series. While working through these tutorials you will learn the fundamentals of object-oriented programming and develop the skills to write your own applications using the C# programming language. C# is a modern, general purpose, object-oriented programming language used to develop desktop applications on both Windows and Mac platforms, mobile apps for iOS, Android and Windows Phone platforms, as well as games for desktop, mobile and even consoles. The aim of this series is not just to teach you the code, but to give you a solid understanding of the object-oriented programming paradigm (covered later in the series). 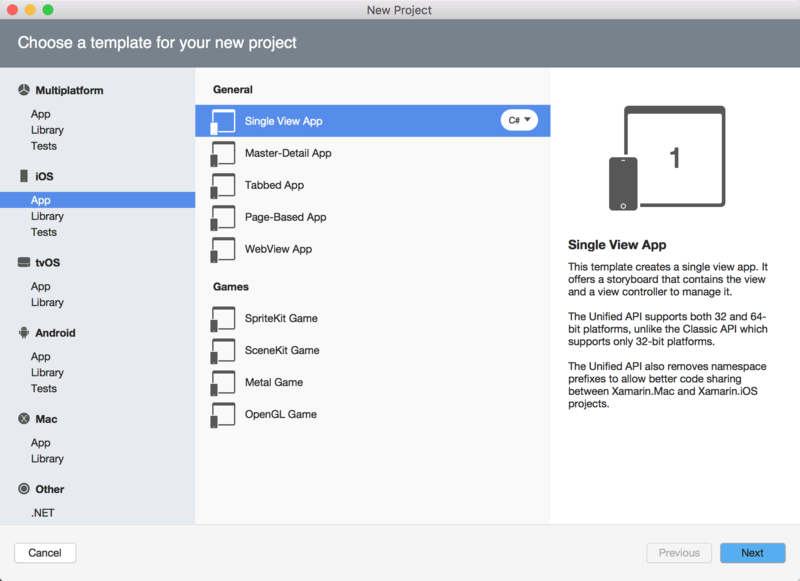 In these tutorials, I will be demonstrating C# coding using Xamarin on MacOS although the steps will be mostly the same using other software on other platforms. Watch the video below and then scroll down to see the sample code for your first Hello World application in C#. 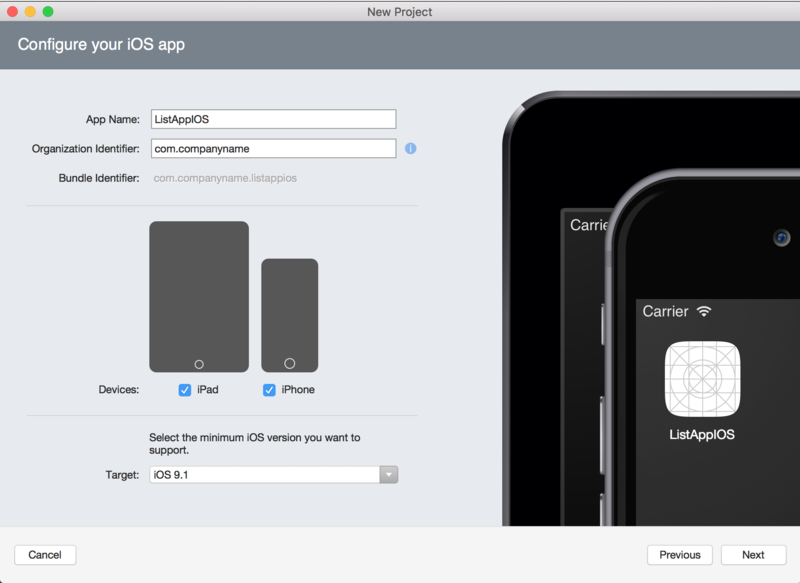 In this tutorial, we will look at how to create a list app for iOS. 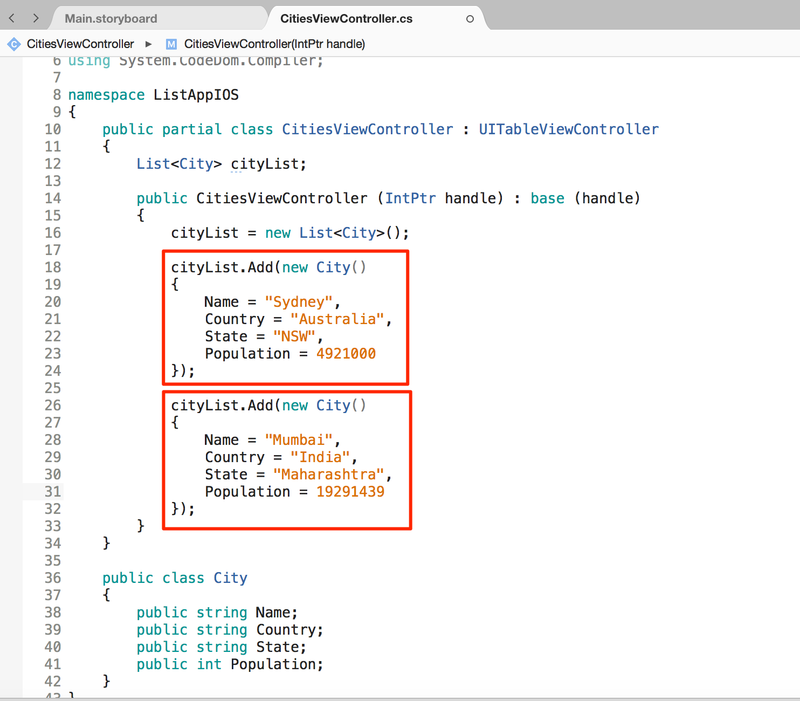 The example used in this tutorial will be a list of cities. When the name of a city in the list is tapped by the user, details about that city will be presented (we will achieve that part in the next tutorial). 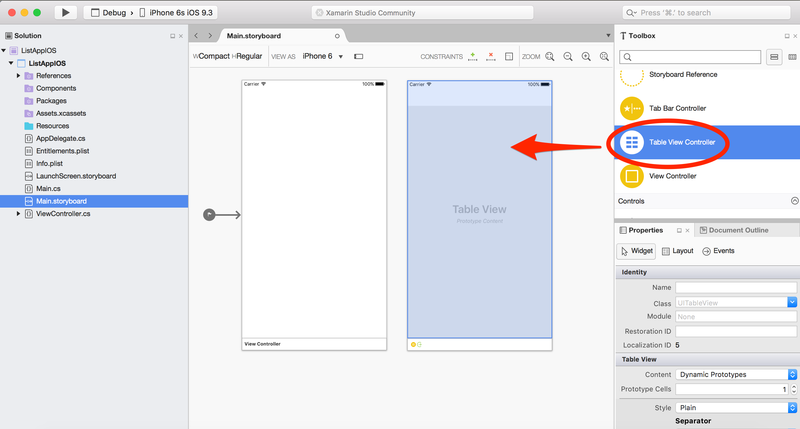 Begin by clicking File > New Solution in Xamarin Studio and then select iOS App and Single View App. Then click Next. Give the app a name (the app in this example will be called ListAppIOS), select the target iOS version and then click Next. 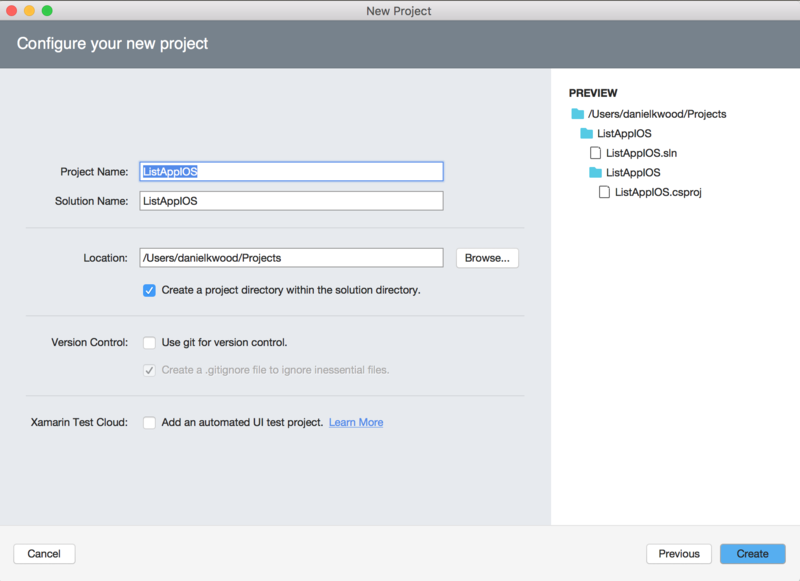 Confirm the project name, solution name, project location and click Create. 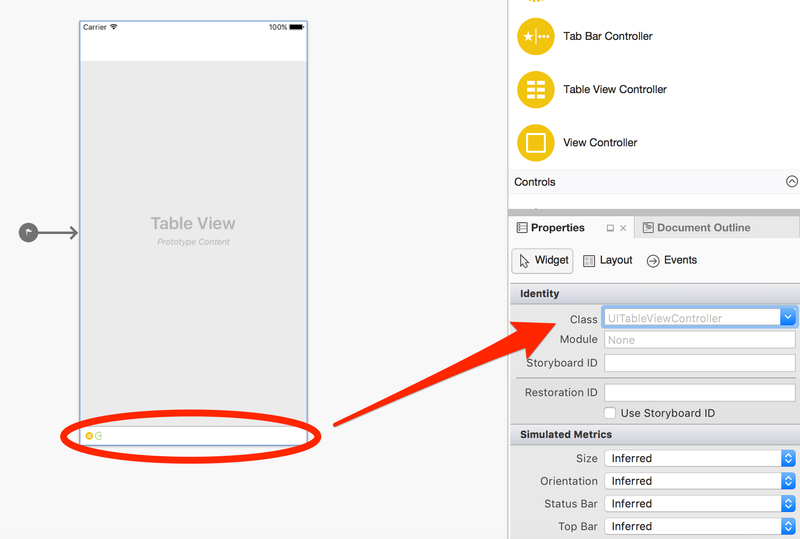 Open the Main.storyboard file and select an iPhone model from the View As drop-down list (eg. iPhone 6). 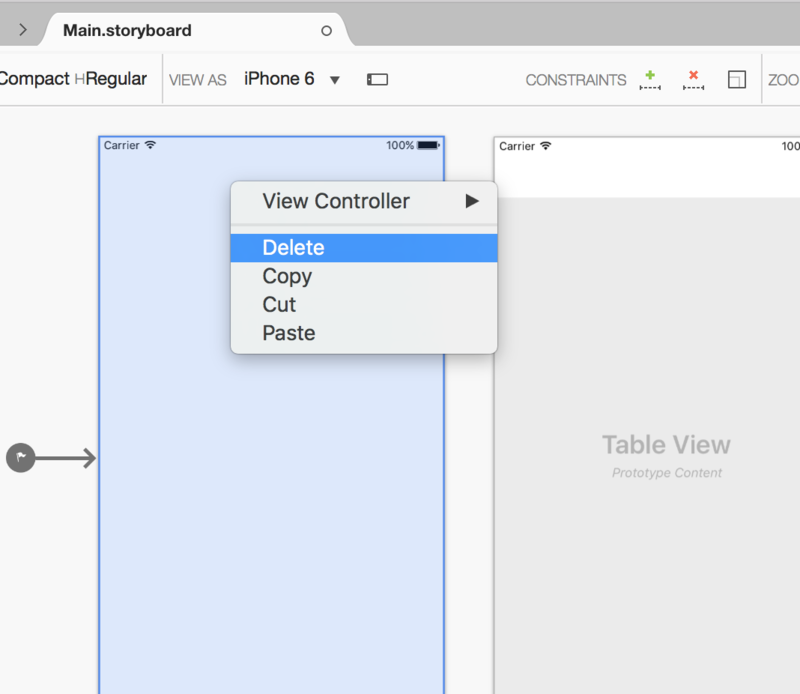 Then drag a Table View Controller on to the storyboard next to the main screen. Now right-click on the main screen (on the left) and select Delete to remove this screen as it is no longer needed (you may need to click Delete twice). 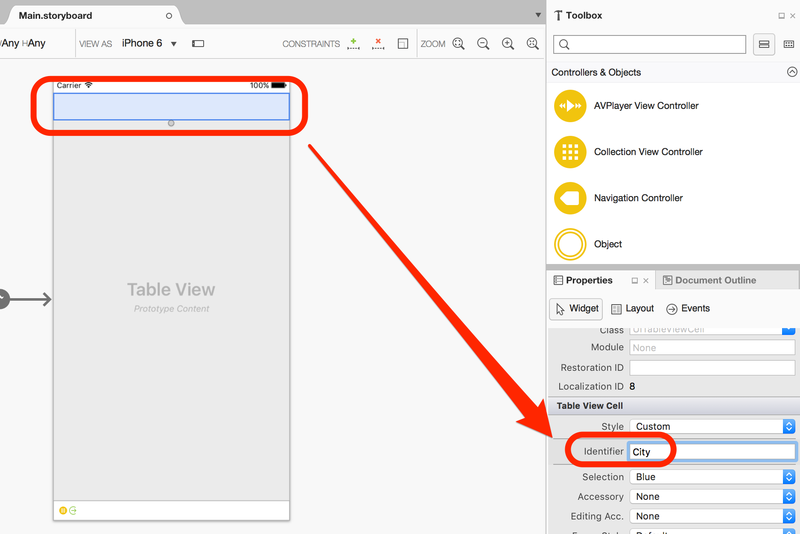 The Table View controller will now be the first screen that loads when the app launches. Now that the first screen is deleted, the ViewController.cs file will no longer be needed so we can delete it. 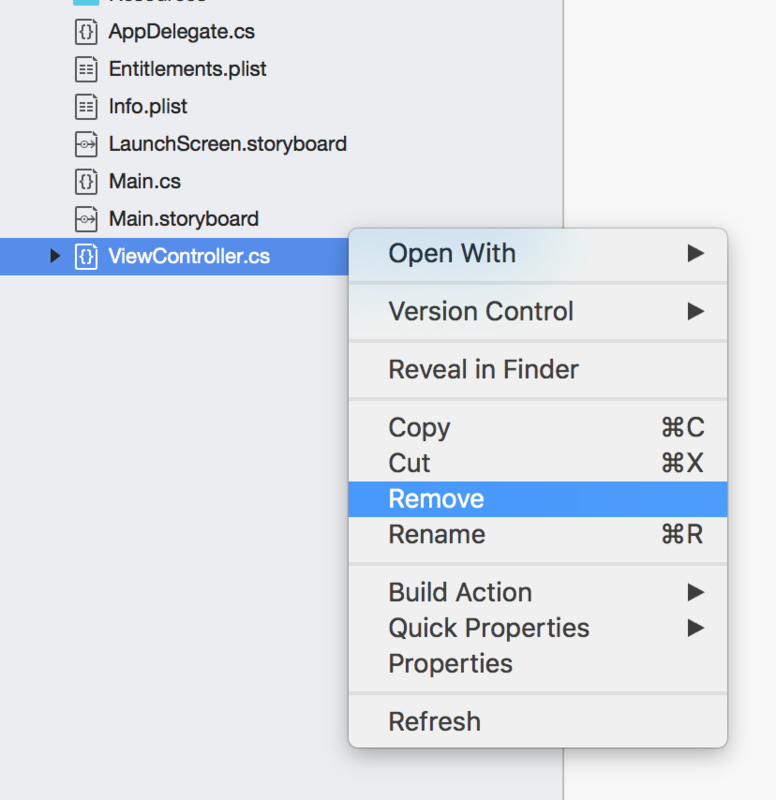 Select the ViewController.cs file, right-click it and select Remove. Then select Delete when the dialog box appears asking you. 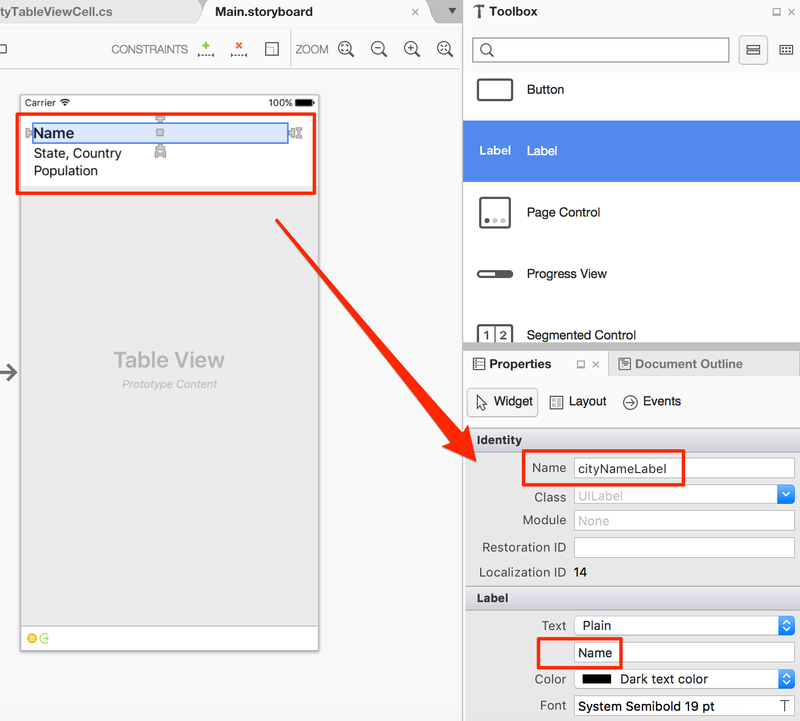 Now you will need a class that will control the table view controller. Select the Table View Controller by clicking on the bar at the bottom of it. You should see the Class property on the Properties panel. At the moment it is empty but it needs a class so we can create the class here. Click in the Class property field and type in a name for the new class eg. 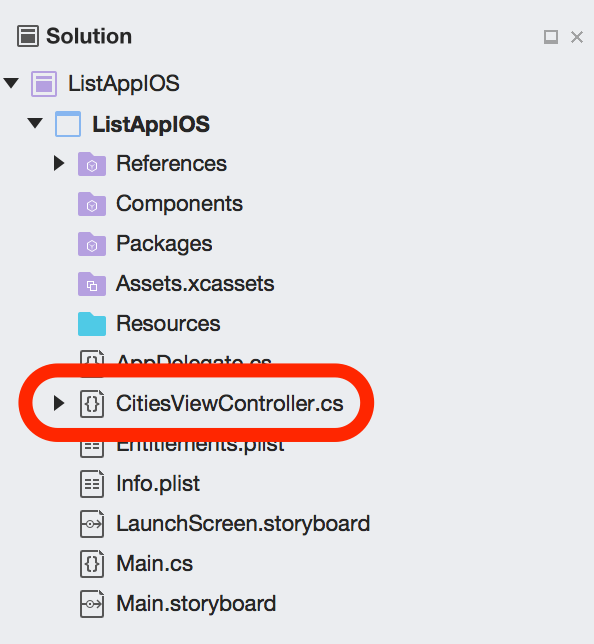 CitiesViewController. Then press Enter. You’ll notice a new C Sharp (.cs) file is created for this new class and it will appear in the solution panel. 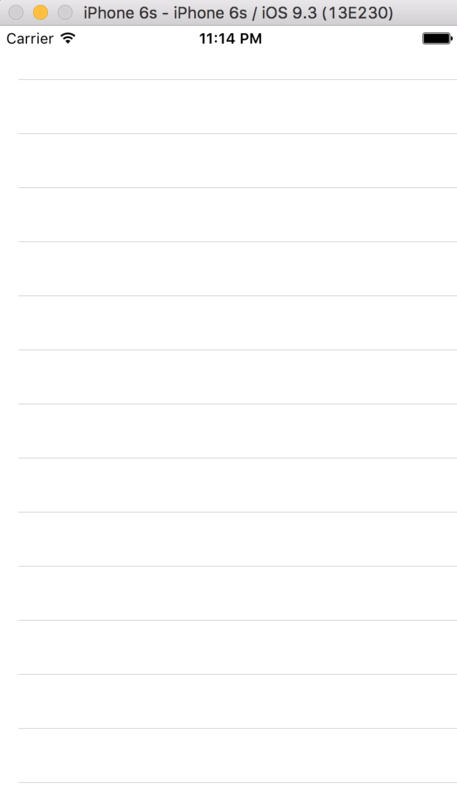 At this stage, if you simulate the app you will see an empty list on the main screen as shown below. Now go back to the Main.storyboard file and click on the title bar at the top of the app screen. We need to add a reuse identifier that allows the app to re-use rows on the table on the app screen as the user scrolls down the screen rather than having to generate new rows. Change the Identifier value to City. 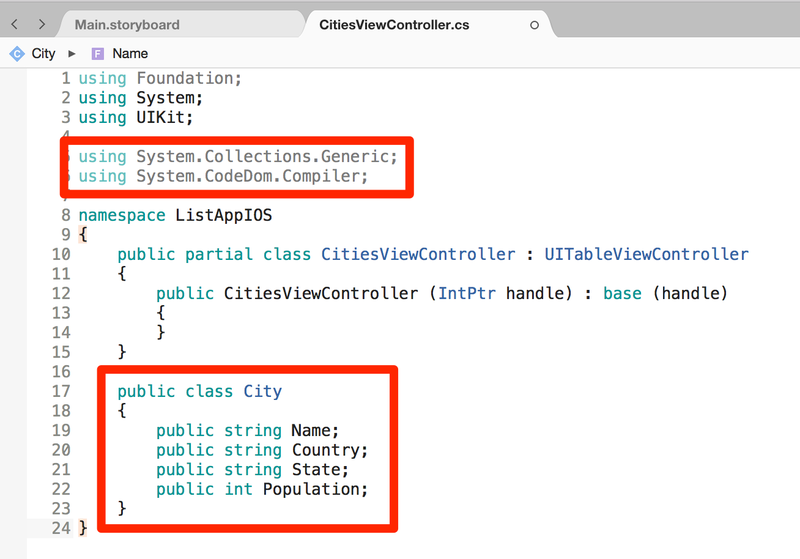 Now open the CitiesViewController.cs file so that you can start populating a list of cities in the table view controller. Adding the using System.Collections.Generic; line allows us to use the List class that can contain many elements. Before we start creating a list of cities we need to define what a city is by creating a City class and giving it some properties such as its name (string), the country and state it belongs to (strings) and its population (integer). Once we have created the class City, we can create a List that will contain many elements and set its type to City so that every time added to the list will be a city. First we give the list its name and set its type, and then we can create the list. Now that we have create the list, we can populate the table view with data from the list. Now we need to override a few of methods: NumberofSections, RowsInSection, and GetCell. For each method, as you type public override and press the spacebar key, you will be presented with methods that you can select from. Start typing the name of the method you want to override and then double-click it to add the override method. The first method we override is NumberofSections which can be set to return 1 because only one section is needed in the table. As shown below on line 36, we set return to 1. 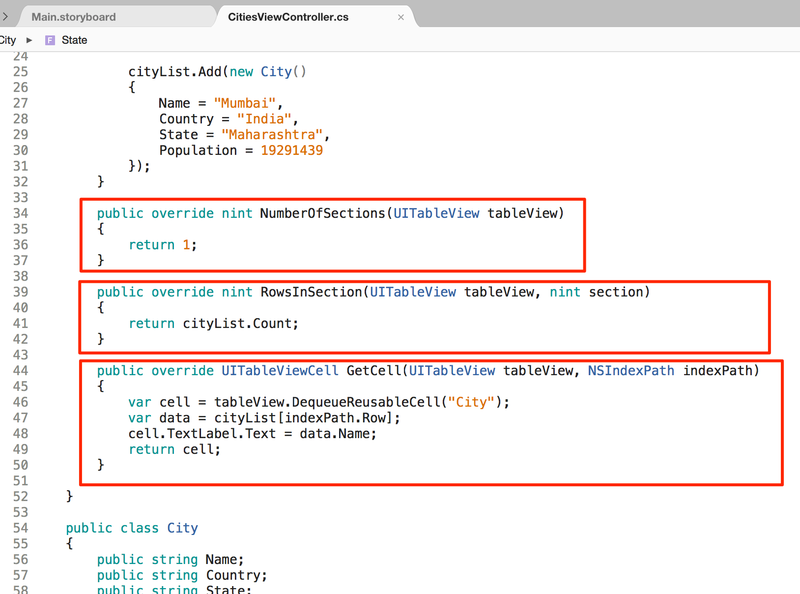 The second method is RowsInList which is set to return CityList.Count; (this will make as many rows in the table as there are cities in the list) as seen on line 41. The third method we override is GetCell which is the method that will allows us to get a re-usable cell, modify its values, and return it to the table view. We create a variable called cell and we use the name of the reuse identifier we set for the table view controller back in Step 8 (line 46). 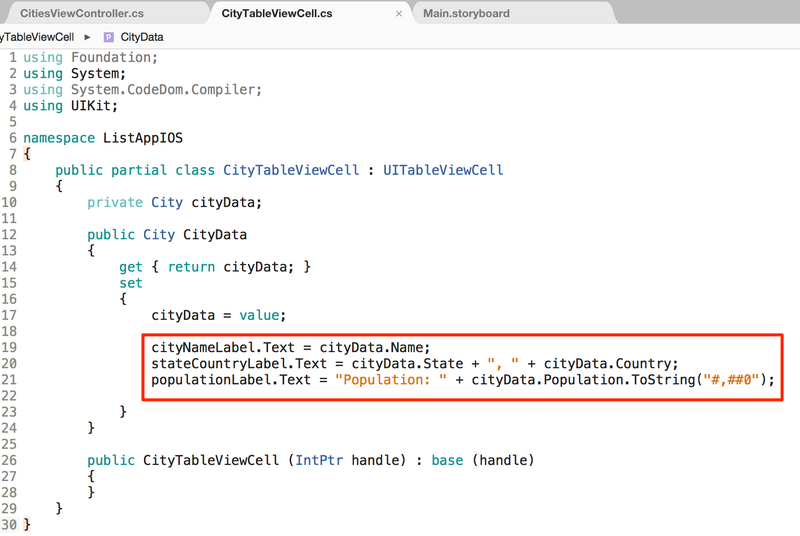 We also create a variable called data which set each row to contain data from the city list (line 47) and we set the text on the TextLabel (a default TextLabel already exists) for the cell to be the name of the city for that row (line 48). Lastly, we return cell (line 49). Here are the three methods once they have been added. 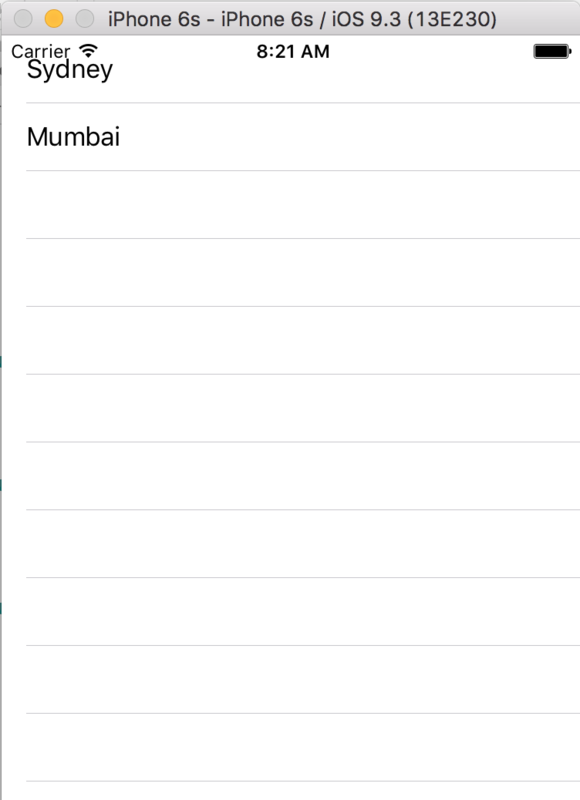 At this stage, if you test the app in the simulator you will see the list with the name of each city on each row of the list (we only have two rows in this list but you can add many more to your list). Now we need to customised the rows in the list to improve their appearance and so they can display some more information about each city. 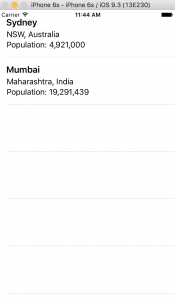 Now we will add more details to each row in the table view (the state and country). 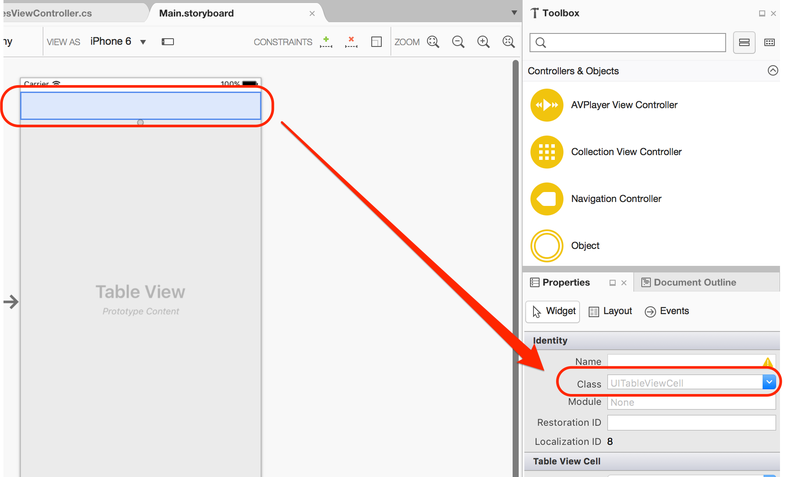 Open the Main.storyboard file and click once on the row at the top of the table view. Go to the Class field. We will create a class that will represent the row. The Class field should currently say UITableViewCell (if it says UITableView, then you may have clicked twice on the row on the screen. De-select the row, then click it once making sure that that the Class field says CityTableViewCell. 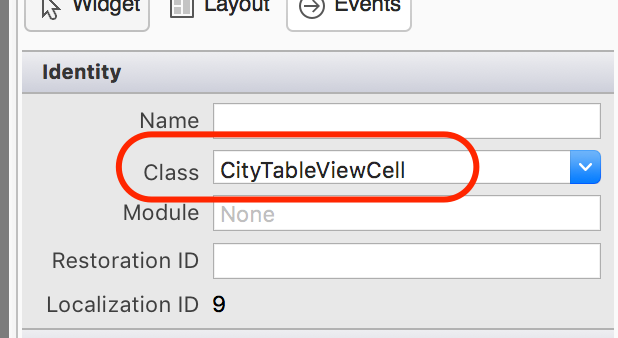 Type in CityTableViewCell in the Class field and press the Enter key on the keyboard. You should now see the CityTableViewCell.cs file in the solution panel. Double-click it to open the file – we will now start adding code to this new C Sharp file. 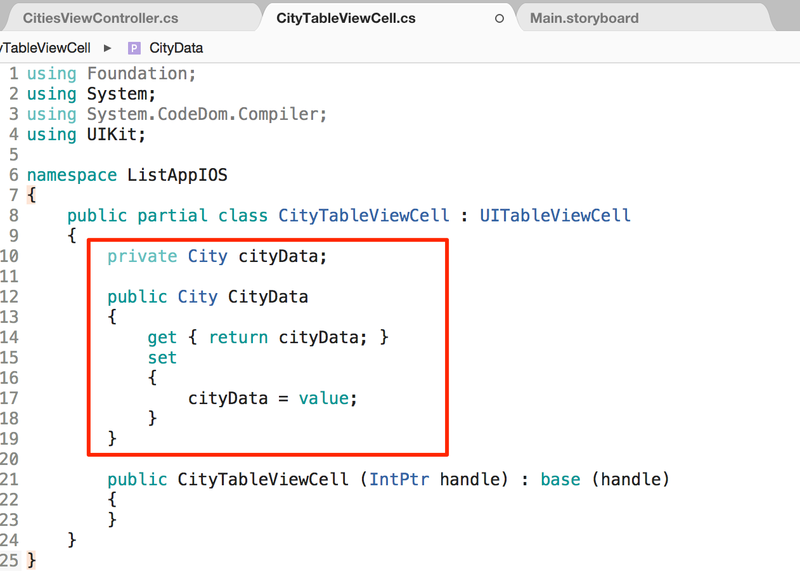 Now we need to create a local private variable called City just for this class. Then we need to create a global variable for this data so it can be accessed anywhere. In this, we will have a getter which will get the method that we will access the value of the property (it will return bookData – the private property). Then we set the bookData to the value we are getting. Go back to the Main.storyboard file. Drag a Label element on to the row at the top of the screen. Resize the row at the top of the screen because it will need to fit more labels by dragging it down from the circle at the bottom of the row. 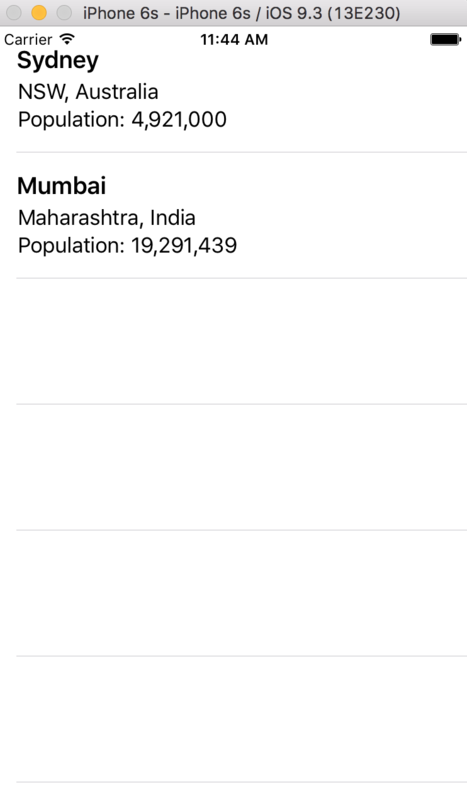 Now add more Label elements to the screen to display the city name, state name, country name, and population. Arrange and resize the labels so they will be able to fit their text in. Give each label a default property for Text so that you know what each label represents. You can also change the colours or font style. For example, the city name label below is set to Size 19pt Semibold. Go back to the CityTableViewCell.cs file. We now need to access the labels from the screen that we created in Step 16 and set the text on the labels to match the properties from cityData when the the cityData property receives its value. Add the lines of code below and then save the file. Note that the state and country are added together with a comma and space in between them. Also note the #,##0 inside the ToString() brackets – this will place commas between the hundreds and thousands for population when displayed on the populationLabel to improve formatting. 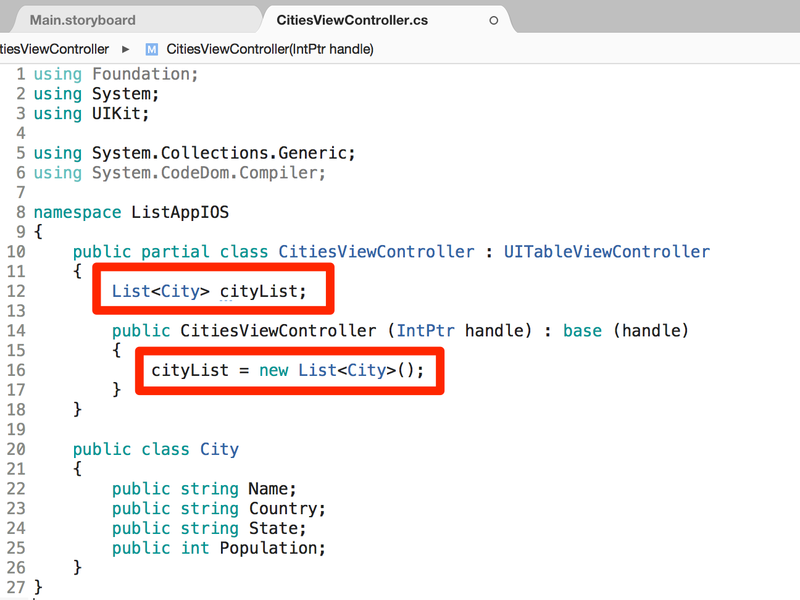 Go back to the CitiesViewController.cs file. 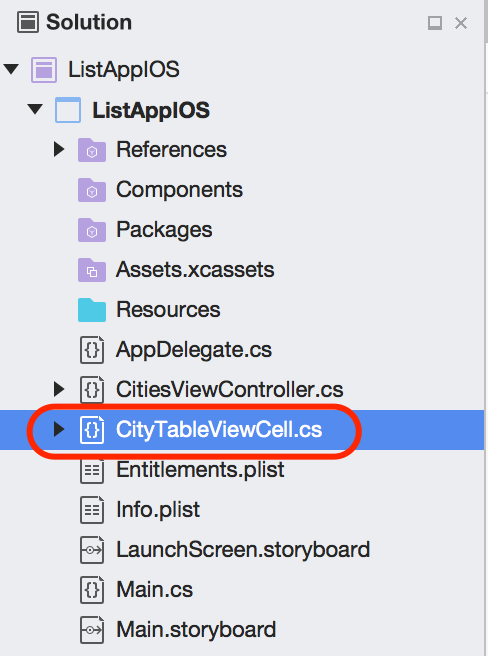 Instead of simply getting a cell, we will now get a cell as CityTableViewCell so we need to add the extra code to the GetCell method as highlighted on line 46 of the code below. This means we are no longer accessing a property of the data but instead we are just passing the city. Now it is time to test the app. 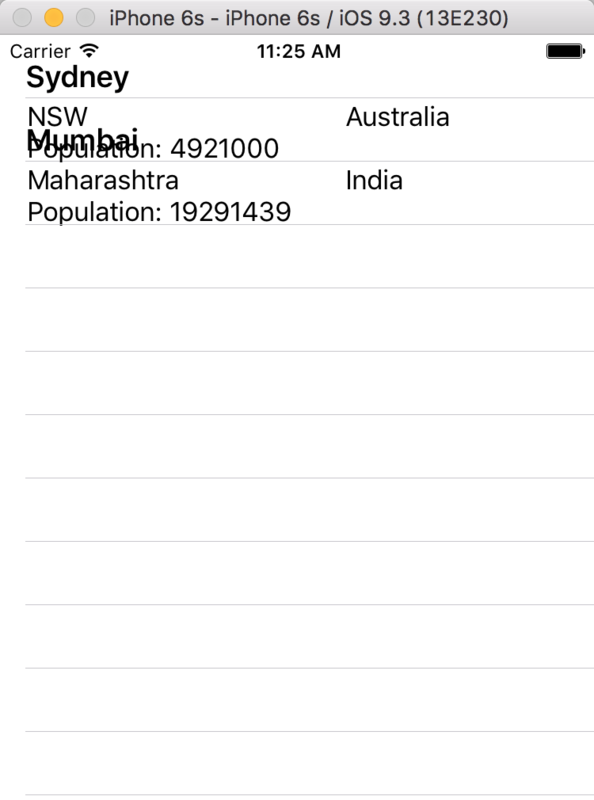 When you test your app in the simulator you may notice some problems with the formatting of your rows such as the row height or overlapping text as seen below. We will look at how to fix this in the next step. After testing, you may realise that you need to change the font size for labels, label width/height, or placement of labels. You may also see overlapping text or items that appear to be in the wrong row. If you see this, you may need to adjust the row height. Click on the Table View (not the row) and then click on the Layout tab on the Properties panel. 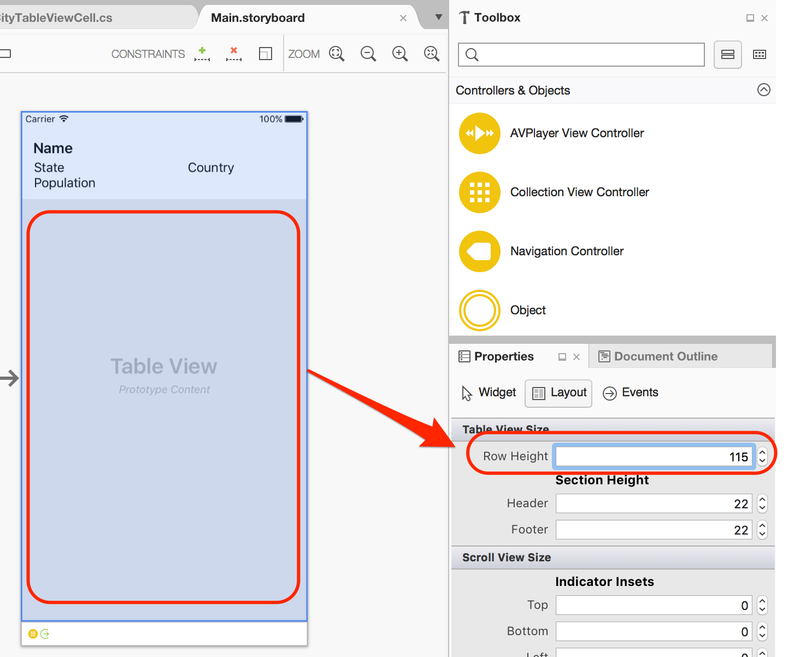 Under Table View Size, change the Row Height value to something more suitable and test your app. Keep adjusting the value and testing as needed. In this example app, the Row Height value has been changed to 115. That’s it! Now you can go and test your app! If you want to add a detail screen for each item in the list, then check out the next tutorial.